Your two-page photo spread of greyhounds racing in England in your 'Pictures of the Year' edition is surely not the image we wish to convey in the United States about greyhound racing or about greyhounds in general. England has fewer tracks than the United States, but kills far more greyhounds each year that are not adopted. Their adoption process is feebly supported by the racing industry. If you look to Ireland, it's even worse. 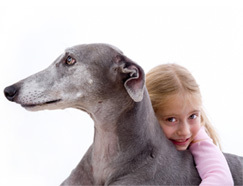 In the U.S., approximately 18,000 greyhounds are adopted into homes each year. That being said, between 8,000 and 12,000 greyhounds are still euthanized annually, partially because of the indifference of the racing owners. Even though the U.S. has the best adoption rate of all greyhound racing countries, we don't adopt enough greyt dogs. I would wager a substantial bet that between the toes of the greyhound on the right is blood. Maybe not everyone would notice that, but many greyhounds sustain terminal injuries while running and, as with horses, may be euthanized on the track. These three greyhounds are not running for fun, they are running for their lives. 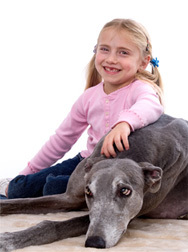 Attached are two photos taken December 6, 2008 of my granddaughter with one of my own greyhounds. Photos of former racers are so much better.